When one door closes, another one opens…I have long been mourning the loss of Dancestore.com’s Mary Jane wedge, which I own in black and red and are staples of my weekly dance wardrobe and what I would choose to put on my feet at the end of a long dance weekend for some comfort. They are down to the last two sizes in brown and appear to be phasing out wedges altogether (I love you Rugcutters! ), which left me in a bit of a panic, as my wedges are definitely 5+ years into their lives with signs of abuse/love – what would I get to eventually replace them? Vote for the Next Charlie Stone Dance Shoe! The fairly recently launched Charlie Stone Shoes is already working on their next swing dance shoe, utilizing the first shoe design’s low/hidden wedge, and you get to vote on what shoe they make next! There are four adorable designs to choose from and all you have to do is go to the Charlie Stone Shoes Facebook page and tell them which shoe is your favorite: A, B, C, or D. I love it when designers incorporate fan feedback – thanks, Charlie Stone! Re-mix News: Sale and New Shoes! In a triple whammy, I see that Re-mix Vintage Shoes has put a number of danceable shoes on sale AND has introduced two new colors for existing styles – Antique Brass Balboa and Gold Metallic Janet – AND has introduced a new style of shoe, the Playtime, a canvas 1940’s wedge in navy/white and red/white. Love love love! I know I do a blog post every time Re-Mix exhales, but this is important because I love dancing in wedges – Re-mix Vintage Shoes has come out with a new wedge they are calling Vogue (or, if you read the fashion bible, you might call it the VOGUE). 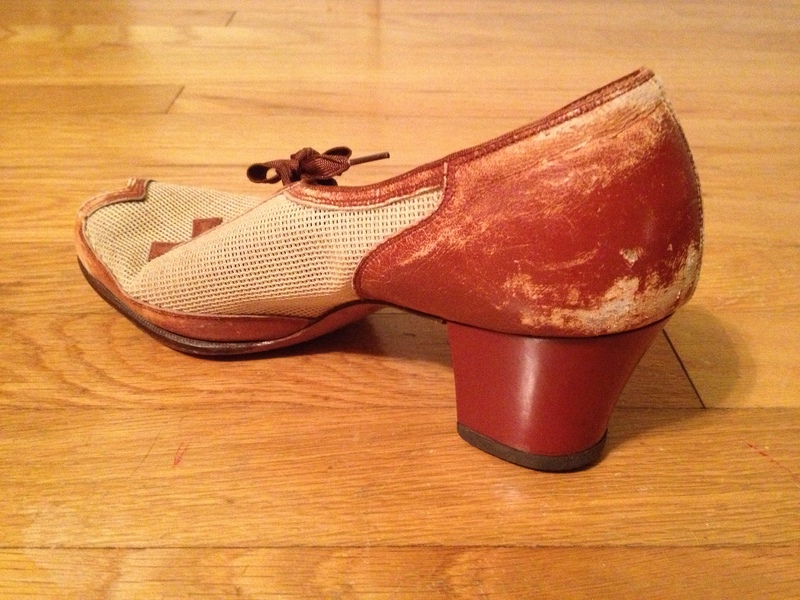 There are a few really good deals on eBay right now for Re-mix Vintage Shoes and Aris Allen dance shoes. For starters, there is a pair of worn-once Remix Deco shoes in the gray suede/black leather combo, size 9, with a starting bid of $10.00. These shoes retail at $194.00, so $10.00 just seems crazy. My guess is that the bidding will go higher than this, but any Remix shoe to be had under $50.00 is a major win. Finally, the best deal of the week as a pair of lovely Aris Allen white satin 1930’s heels, size 10, with a starting price of $0.99. That’s right, 99 cents! The shipping is more than the cost of the item, but even then, it still puts you in a pair of dance shoes for less than $15. Winning! It’s been a while since I’ve posted any Remix Vintage Shoes from eBay, so here are a couple of pairs of Greta wedges at a fairly reasonable price – red in size 9 and black in size 8. Enjoy! Continuing with the shoe theme and the pink theme, I’m posting this eBay auction for a pair of Remix Open Toe Spectator Wedges in pink and black, size 7-8. I’ve never seen this color combination before, but I like it. 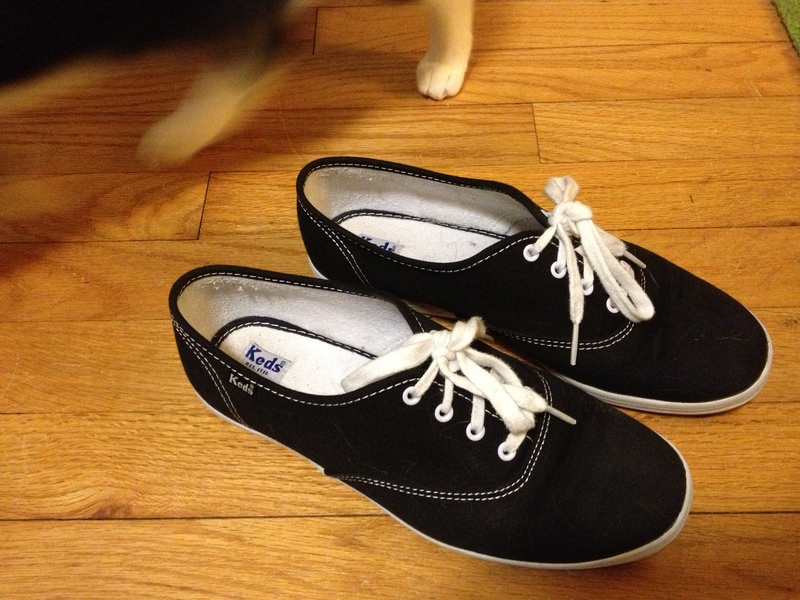 The shoes are a size 8, but the seller says she wears a 7 1/2 wide and that the size felt more like a 7 to her. 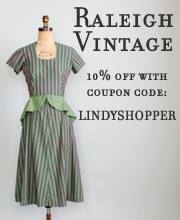 Starting price is $20, but the buy-it-now is $50! $50 for a pair of Remix shoes? You know what to do. A couple of pre-owned Remix shoes popped up on eBay at a good price. First, a solid wedge, the Open Toe Spectator in black on black, with only two bids and current bidding at $41.00. 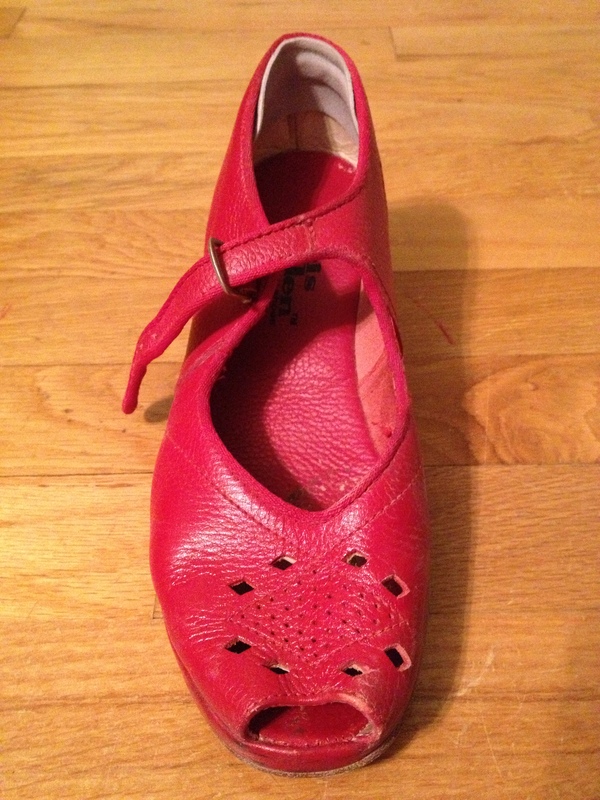 Second, my absolute favorite pair of arrival sandals (due to their supreme comfort for after the dance), the Dara, in a smashing shade of red, with the bidding at $31.00. Either technology or eBay is being uncooperative today, so the only photo I can share with you is of a pair of new red Dara shoes from the Remix website…but you should still check out the auctions if you are a size 9! Well, maybe not everything, but silver/pewter shoes certainly go with almost everything. They are neutral without being boring – a little bit shiny and exciting. 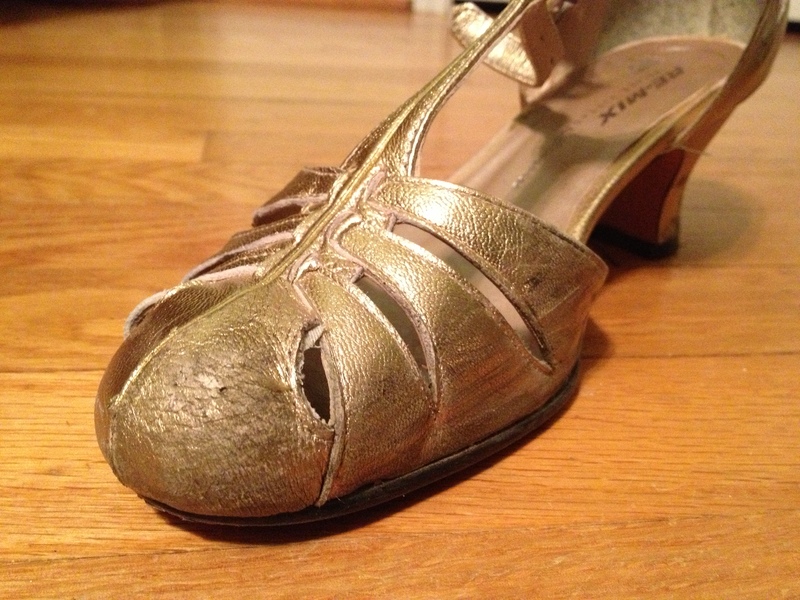 A pair of Remix pleated toe wedges in silver showed up on eBay this week in a size 10.5/11. The Buy It Now is about half the retail price of this shoe, but the seller is open to offers. It definitely never hurts to make an offer. Not one, but two pairs of Remix Picasso wedges popped up on eBay this week. First, a lovely pair in red, new in box, size 9. 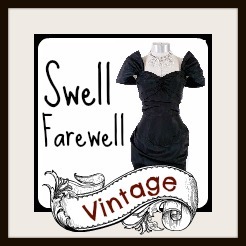 Second, a pair in basic black, worn twice, in a size 10 with a starting price of $39.99. ¡Amo el zapato de picasso!